Personally I do not like the taste of spring onions but they are essential to some Asia dishes and I must admit that they do give a unique aroma to the dishes. A packet of spring onions cost slightly more then a dollar for 4-5 bulbs. As a weekend home cooker, I'll probably use 1 small stalk for a dish then chuck the rest of it into the fridge. It will most likely still be there the following week or even the week after next. By the time I need to use it for a dish, it has turned yellow or dried up. There goes my $1... It happened so many times that most of the time I just omit this from the dish I am preparing to cook, I really do not like to waste food no mater how much they cost. So, feeling guilty I decided that I want to grow my own spring onions! I bought a packet of beautiful spring onion last week, telling myself that after using some I will put them into the water and grow them. It did not happened until yesterday while I was preparing dinner. I went to the fridge to take them out only to discover that they've turned limp, dry and yellowish. 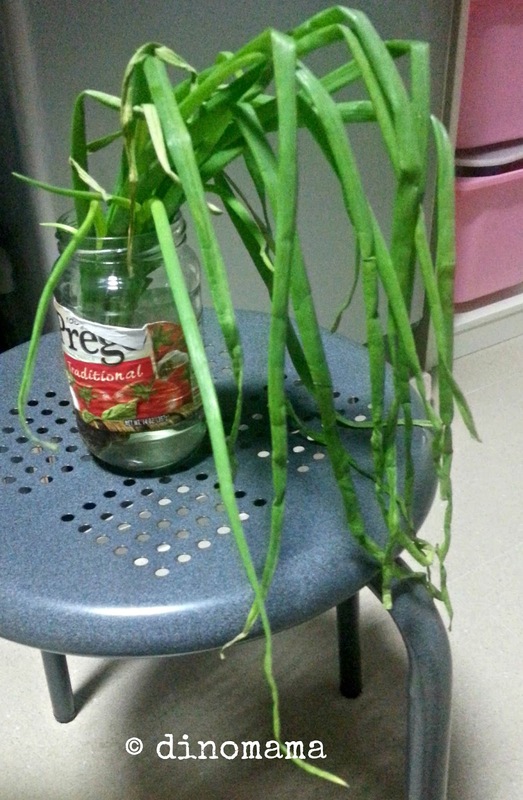 Regardless, I took 2 bulbs with roots and plopped them into a jar filled with enough water to cover the roots. Looking at it, I realized that's a lot of spring onions! Let's hope that they will flourish and able to last for at least a month, or long enough for me to find out how to grow spring onions in my balcony. Till then, I am satisfied with them sitting at my kitchen counter. I do the same thing with my spring onions too! If you snip off the tops, they will keep sprouting back. Definitely a good move! I checked mine and its dying!!! I think I have to put it in the soil. The spring onion is fully grown. All it will do is produce a flower of sorts and go to seed. However, the water will keep it alive for a while. Have you tried slicing it very finely, srparating the strands, and adding them to dishes? Returning the visit from UBC. Yes spring onions can be tricky. But like you say many Asian dishes would be very different without this delicate plant.